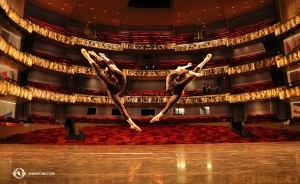 It’s rehearsal season and Shen Yun headquarters is abuzz. Even outside of studios and offices you’ll see dancers familiarizing themselves with new movements, choreographers and composers huddled together in mini meetings, and wardrobe staff trekking across campus with their newest creations and alterations. Just weeks into rehearsal, we can predict that 2019 will be our greatest season yet. 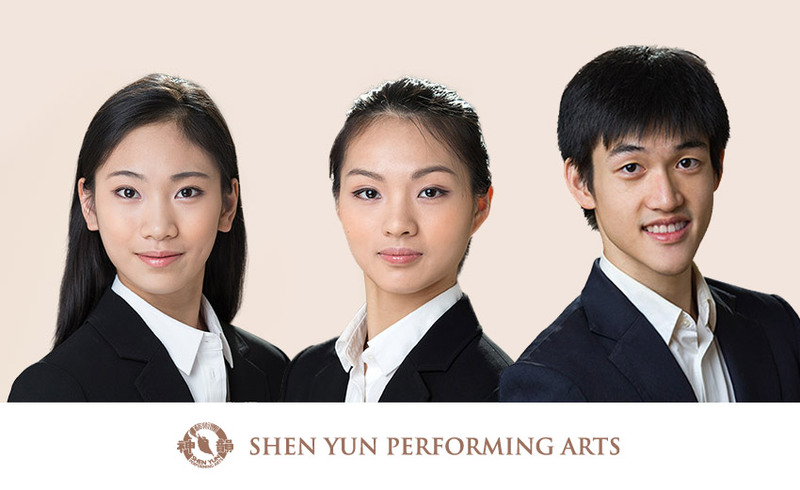 And as Shen Yun continues expanding year by year, a flux of talent is bringing us to new heights. 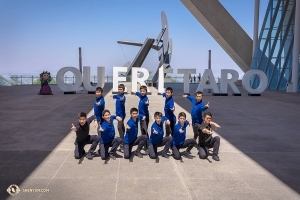 While just-joined members are eager to give their all, dancers who have proven themselves in hundreds of performances are pushing themselves to explore untried territories. In the coming season, we are excited to present fresh faces in a myriad of riveting roles. Each principal dancer is preparing to star in multiple pieces next season. In the months before December—which always fly by faster than we realize—they’ll spend countless hours in front of the mirror (and everywhere else) perfecting their roles. 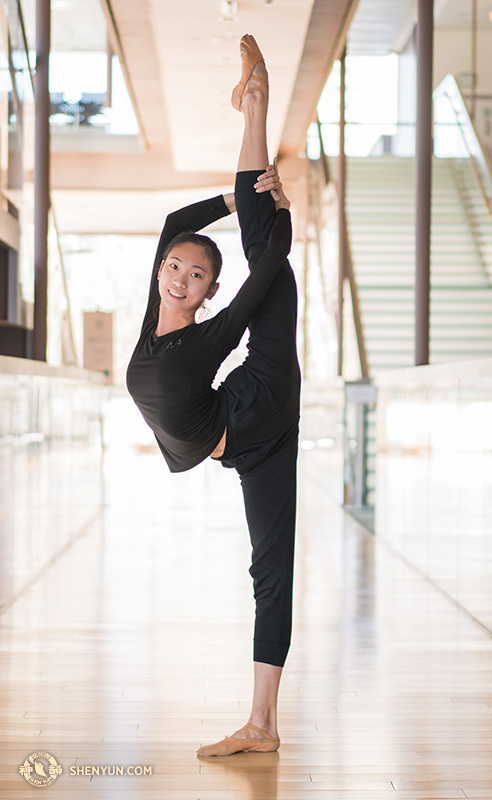 Below we’d like to introduce you to a few of our newest principals, including the 2019 season poster girl Michelle Lian. To begin with: Lian grew up in Taipei, Taiwan. 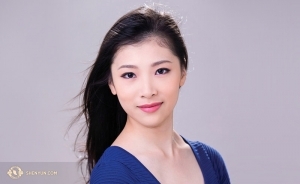 She has studied classical Chinese dance since age 7 and joined Shen Yun in 2013. 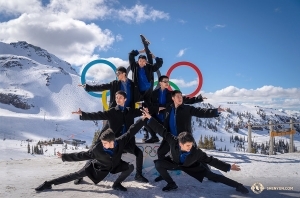 Lian won first place in the junior division of New Tang Dynasty Television’s International Classical Chinese Dance Competition in 2014 (tied) and 2016. 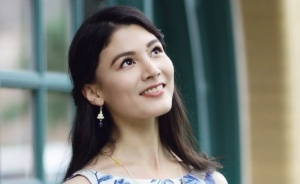 Her Chinese given name Xu (旭) means “the brilliance of the rising sun.” Lian’s go-to happy food is mint chocolate chip ice cream, and her dream vacation is to visit every part of Japan. ML: I felt very happy every time I danced Hmong, even though it was really physically demanding. Chinese folk and ethnic dances are usually cheery and lively, and Hmong dance is one of the best examples. Hmong music has a really strong rhythm. Some parts of the piece are drum solos, and when the dance picks up speed the tempo can get really fast. Last year at the beginning of the rehearsal season, we had a ‘fun’ time trying to keep up with the music. It was almost like a game. The Hmong costume is a traditional knee-length pleated skirt with intricate embroidery, plus a ton of silver jewelry: there’s a crown-shaped headdress, bracelets, anklets, and a bib necklace. As the lead, I begin the dance wearing the biggest necklace ever—it has the circumference of an extra large pizza—that was my favorite accessory last season. Also, the dress and silver jewelry are decked with little silver bells all over, so that with every movement we’re jingling with the music. I loved the jingling bells. They made the whole dance so fun and happy. To begin with: Zhu was born in China and began learning piano and dance at age 5. 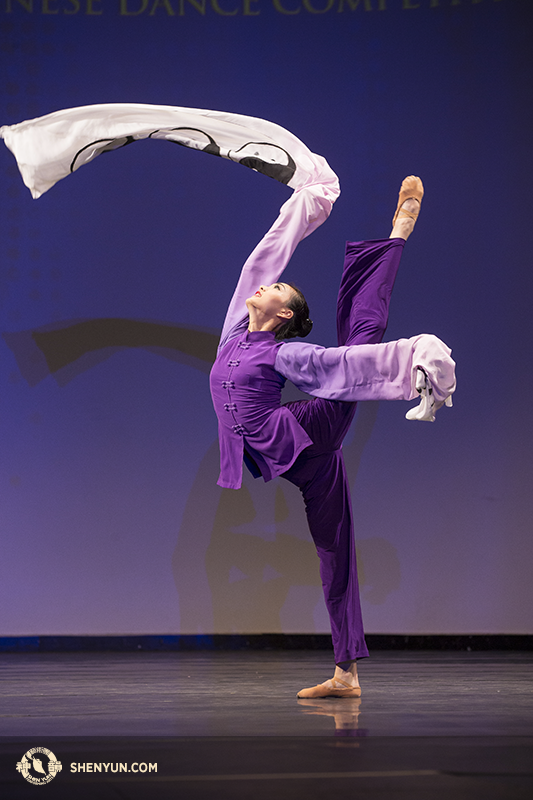 After studying at Fei Tian Academy of the Arts in New York, she joined Shen Yun in 2013. 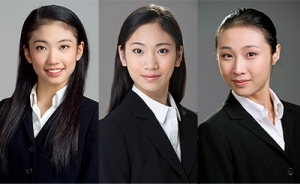 Zhu won first place in New Tang Dynasty Television’s 2016 International Classical Chinese Dance Competition (adult female division), and first place (junior female division, tied) in 2014. On tour, she loves visiting the historic cities of Europe, strolling down their age-old streets and peeking into quaint little shops. And when there’s time to sit down and enjoy it, dim sum makes her day. EZ: Last season, I really felt the importance of the power of the group. Whenever I was having a difficult time or was feeling down during the performance, there would always be someone who’d come up to me to give me support. At critical moments, it helped me be more group-oriented and think of the bigger picture, instead of being stuck on myself and my own problems. It was the power of the group that helped me keep going and picked me up when I fell down. There was a period of time during the tour when I could hardly move my back. It even hurt when I was sleeping at night. I was really sad that I couldn’t feel 100% during the show, especially for the fan dance (Elegance in the Middle Kingdom) where I had to lead. One day, another dancer told me: Nothing can break you if you make yourself unbreakable. Her words really encouraged me to overcome the difficulty in my mind. All the other girls in the group also gave me a lot of support and positive energy, and as I became less negative my back began improving as well. In retrospect, I’m really thankful to my teammates from the bottom of my heart. We all know that we have to do well individually as well as help each other push our group forward. We’re shouldering a big responsibility together; we’re like one big family. To begin with: Lee was born in Pasadena, California and has lived in Taiwan and Macau. 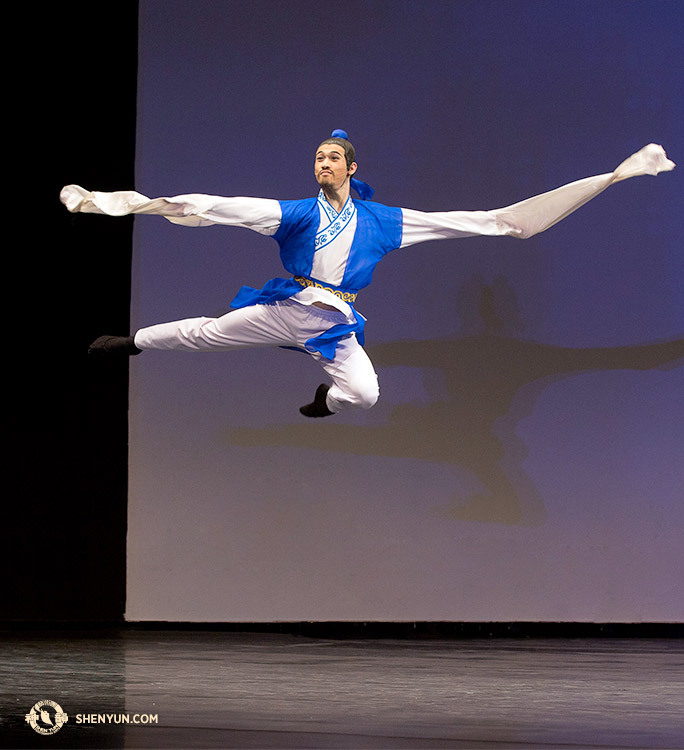 He won second place in the 2016 adult male division of New Tang Dynasty Television’s International Classical Chinese Dance Competition after placing third in the junior division in 2014. During the rehearsal season, Lee begins his day running laps around the lake on campus. Before performances, he gets a boost from a cup of hot oolong tea and a handful of trail mix. BL: Lao-Tzu, the founder of Taoism, is said to be one of the most influential philosophers in China. His name means ‘Old Master’ and comes from his appearance. According to legend, he had the appearance of an old man at birth. The character of Lao-Tzu carries a presence of great wisdom and authority. It took a lot of practice and mulling to grasp the calculated-yet-easy composure he bore, and to incorporate those features into the dance. To add to the challenge, there were many techniques and interactions with other characters, all of which had to be executed precisely within the dynamics of the music. In theater arts, a performer must feel, think, and react as the character he’s portraying. Lao-Tzu was no easy character in this regard. Several times during tour I felt like I couldn’t portray Lao-Tzu’s character as well, because I wasn’t upholding myself to high enough moral standards in my daily life. 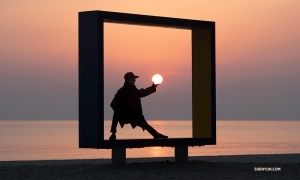 I had to look within and adjust myself. And only then could I understand Lao-Tzu better, and improve my depiction of him. Lao-Tzu was the deepest and most meaningful character I have portrayed. And after a hundred-plus performances, the depth and meaning of the role has shaped me in the best of ways. Just one complaint: The fake beard kept getting in my mouth. Not tasty. Shen Yun 2019 is in the works and our tour schedule is filling up fast. Stay tuned for updates and more!